HOME > What are Mikurumayama? It is said that Maeda Toshiie, the first lord of the Kaga Domain, was bestowed with the same court carriage used by the powerful daimyo, Toyotomi Hideyoshi, to greet Emperor Go-Yozei upon his Imperial visit to the Jurakutei Palace in Kyoto in 1588. Maeda Toshinaga, the second lord of the Kaga Domain and founder of Takaoka, later presented this carriage to the townspeople of Takaoka around the time of the construction of Takaoka Castle in 1609. Thus, the history of Takaoka’s Mikurumayama floats was born. The Mikurumayama floats are considered one of the finest floats of this kind in all of Japan – noted for their unique court carriage structure along with tall wooden hoko pole, as well as for their elaborate ornamental work, crafted using Takaoka’s most exquisite artisanal skills in the fields of metalwork, lacquerwork, and tapestry work. 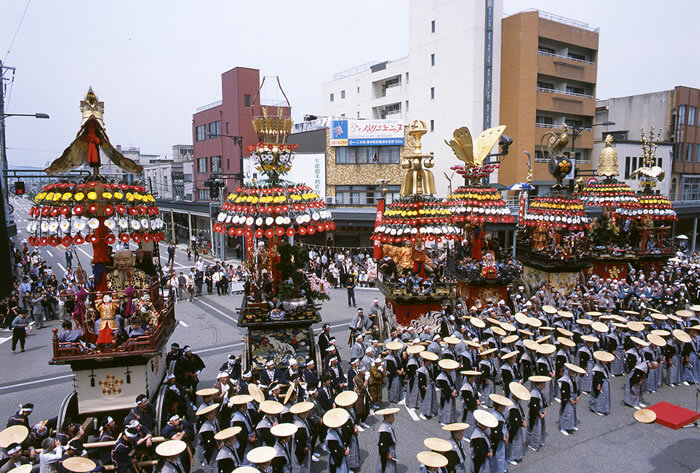 The Mikurumayama floats are registered as both Important Tangible and Intangible Folk-Cultural assets of Japan, and are one of the five items across Japan that have obtained this special status.